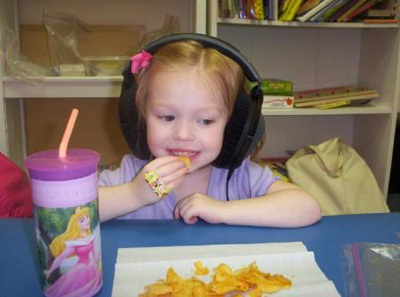 Therapeutic Listening™ is a program that uses sound in combination with sensory integrative treatment strategies to improve a child's ability to "listen with their whole body". Listening is a function of the entire brain and goes well beyond stimulating the auditory system. In order to fully address listening difficulties one must attend to the listening functions of both the hearing ear and the body ear. Improvement in modulation (i.e. sleep/wake cycles, toilet training, improved attention, a reduction of sensory defensive behaviors, and more). Improved motor control (i.e. 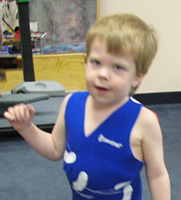 use of bilateral motor patterns, improved fine-motor skills, improved articulation). Improved spatial-temporal organization (i.e. improved handwriting, timing of movements, etc. Improved communication including emotional expression, pragmatic skills, and non-verbal communication skills. Our Handwriting Without Tears™ (HWT) program is based on the complete handwriting curriculum developed by Jan Z. Olsen. This is both a developmental and multisensory approach to teaching handwriting skills. Designed for children from kindergarten pre-writing level to printing and cursive. The instructor is a registered occupational therapist with training in the HWT curriculum. For more information: http://www.hwtears.com. The unit can be used to train search strategies and improve ocular-motor skills such as localization, fixation, gaze shift, and tracking. While using the D2™ patients can improve peripheral visual awareness, visual attention and anticipation, and improve eye-hand coordination and visual-motor reaction time. For persons with motor impairment, the D2™ can be used to increase upper extremity active range of motion and coordination, muscular and physical endurance and improve motor planning. It has been successfully used to improve function in children and adults with limitations from stroke, head injury, amputation, spinal cord injury and orthopedic injury. TheraTogs™ are a therapeutic system intended for use as an adjunct to sensorimotor training, pediatric joint and bone development, and to physical rehabilitation following brain injury, stroke, and orthopedic surgery or neurosurgery. The idea behind TheraTogs™ is to enable the therapist's hands to "go home with the child". For more information: http://www.theratogs.com. The speech therapy staff has experience using a variety of different communication systems, including Picture Exchange Communication System (PECS), low-tech devices, as well as high-tech (computerized) devices. The staff also has had great success in receiving funding for children who need such devices. Feeding issues in children may be the result of reduced oral motor skills, differences in oral sensitivity, difficulty tolerating a variety of textures, food aversions due to sensory processing issues or as a result of oral or gastrointestinal distress. This may lead to poor nutrition, poor weight gain or delayed feeding milestones. Our Feeding Evaluation Clinic is an assessment and treatment planning process in which an occupational therapist and speech-language pathologist collaborate to identify the difficulties preventing a child from experiencing typical eating habits.